Anyway, my story Joining (recently performed in a slightly different version at Towersey Festival) was a runner-up in Litro magazine’s cults and clubs competition, you can read it here. It’s been a month for getting mentioned on other people’s websites, and you can also read my guest blog about publishing short stories on BooksEtc. 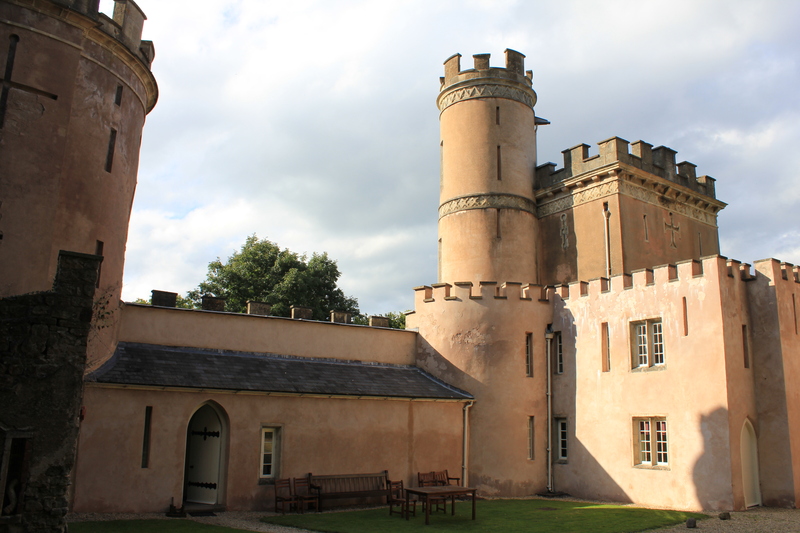 Clytha Castle has been on my list of places to stay for a long time – a folly in the best sense; it is a pinkish rendered, Gothick, castellated and turreted confection on a small hill in Monmouthshire – with panoramic views of Skirrid Fawr and Sugarloaf. 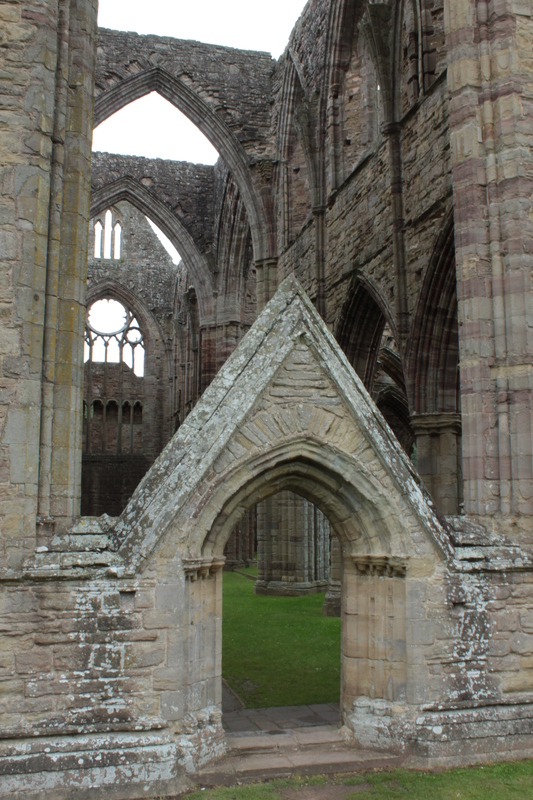 It is gloriously daft – every opportunity for a Gothic arch or alcove has been enthusiastically taken up, and one tower is ‘ruined’ and probably was built that way. Clytha castle is surprisingly big. The impression the building gives is of pink sweeping curves everywhere, intersecting the green curves of lawn and hill, and the grey curve of the ha-ha that stops the cows clambering into the garden. I had imagined, like so many follies, that it would be mostly trompe l’oeil, but aside from its ruined tower and absurdist curtain wall, it is a fully functioning building: mainly a solid square tower, but attached to the tower is a circular stair turret and embracing that, a curved passage that connects one half of the tower to another where a ground floor bathroom and bedroom are tucked away. Up the stairs this layout is replicated, (although the bathroom is less successful, extraordinary 1980’s tiles and a bath too narrow to get both shoulders into!) then a further short flight takes you to the best bedroom at the top of the square tower, which A and I get, much to my delight. 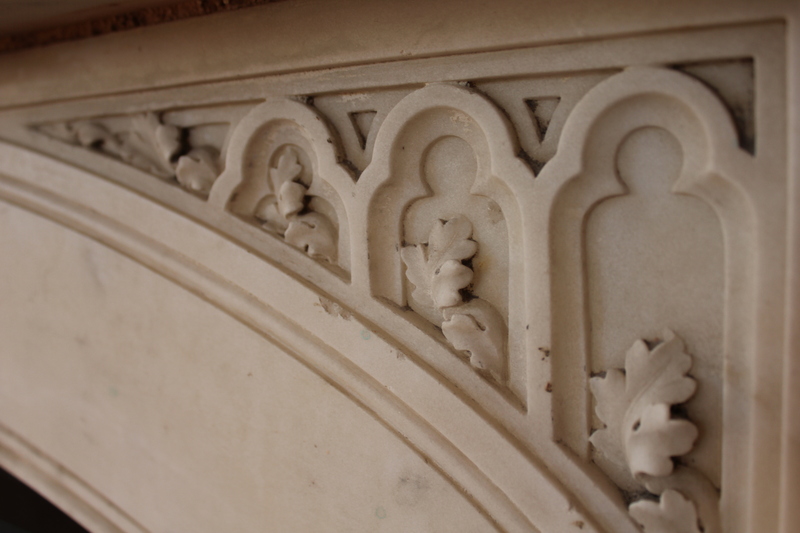 This is painted a not entirely successful shade of apricot which could do with being a bit yellower, but has 3 sets of Gothick arched windows on two sides, and a beautiful marble fireplace, on which delicate oak leaf carvings overflow the recessed arches in the spandrels. Up a further flight of stairs is a half-height door which takes you onto the roof. 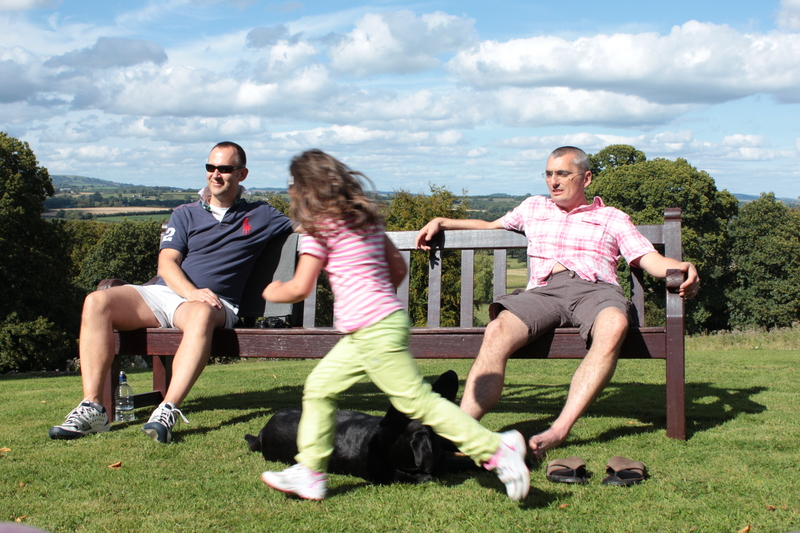 The battlements are too tall to see over, but the Landmark Trust, every thoughtful and trusting that their guests can look after themselves, provide a sturdy bench just high enough to give a view. Back down stairs, a long narrow stone paved passage takes you to the kitchen in the round tower. Landmark specialise in round (and occasionally octagonal) kitchens, although this is larger than most, with a vast scrubbed table to eat at. Once again, Gothick arched windows and alcoves abound. Satisfyingly, the stair turret and the round rooms have doors that curve to fit. The living room (more Gothick Arches) has a massive door which opens onto the spectacular view, and we spend a fair bit of time sitting with this door open looking at the view. This is what I call gracious living… There is something about the house that reminds me of Elizabeth Goudge’s children’s classic, The Little White Horse (without any justification that I can think of, since the house in the book is far older). There are owls in the woods, and they start calling early. After dinner we go out to look at the stars and play with T’s astronomy app which, once fed the co-ordinates of where we are, will, if pointed at a constellation or individual star, tell us its name. It even knows about some of the satellites. This is great fun but you get a terrible crick in your neck. It’s a bit weird that, when resting my neck I lowered the iPad and it happily informed me of the stars beneath my feet. If there is another clear night (sadly in doubt) we will take the deck chairs out. When we go to bed I take the walking map with me. Saturday morning we are all up ridiculously early, and are out of the house well before nine. The weather is cloudy verging on hazy sunshine and the mountains have reappeared from their early morning cloud cover. 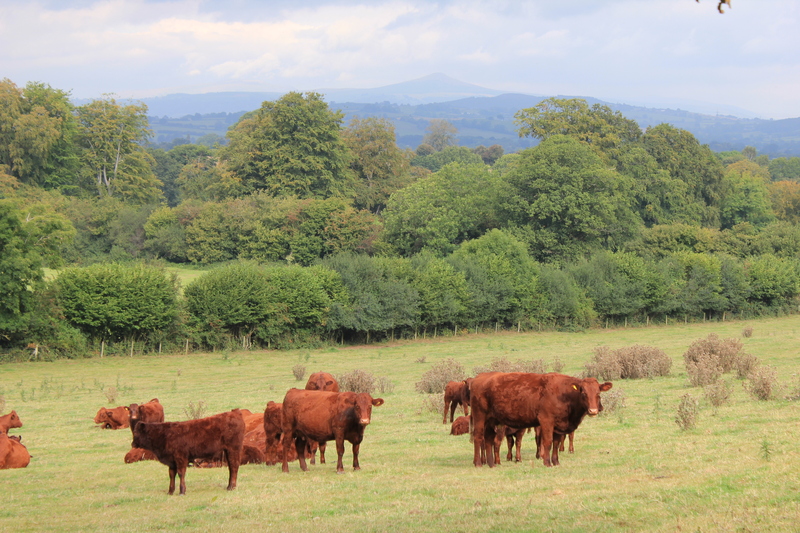 Walking across the parkland, we come across some soft brown calves and their parents. They are very sweet and have dramatically deep voices. We are distracted by them and head the wrong way as we reach the road, which means we get to see the gateway of Clytha House which is rather fragile looking but once again Gothicked to death. We retrace our steps and find the riverside walk along the Usk, which changes its character very quickly; one minute shallow and rapid over rocks, the next as still as a mirror. Daisy is desperate for a swim, but the sides are steep, so she is told no. Then we come to a stream and Daisy, ignoring all demands to the contrary, heads into it and from there into the river. 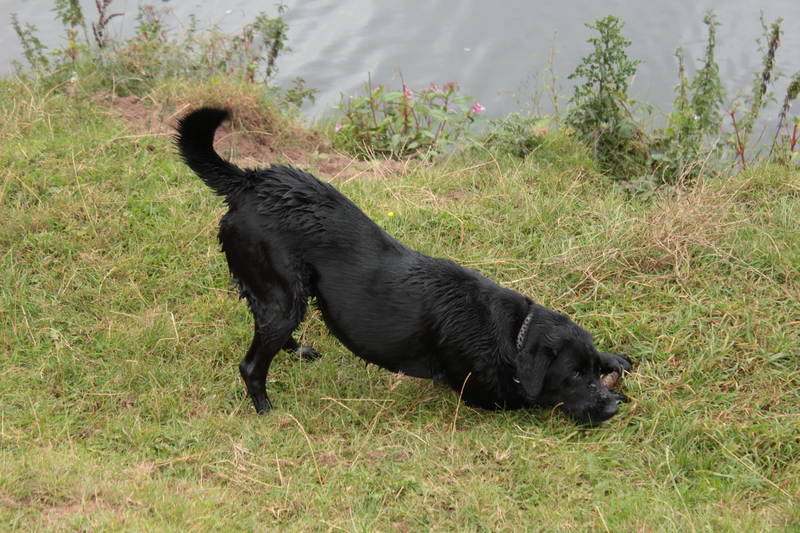 Fortunately there is some reasonable access so she is given sticks to retrieve and comes back wet and happy. Buzzard wheel overhead, rooks, crows and a raven put in the occasional appearance. Our combined map reading is not very efficient; partly because Jn, Jm and T stride ahead so much we often overshoot a turning, partly because I’m just out of practice, partly because the stiles are overgrown and uninviting. One alleged bridleway is so overgrown there is no way it could be ridden along, you would be decapitated by over-hanging branches. The hedgerow here has been recently planted, about four feet away from where it has at some stage been grubbed up, leaving only the occasional hawthorn. There is another large group of cows and calves, this time in the same field as us, so Daisy is put on her lead and we creep past sheltering behind the meagre cover of the hawthorns. I get stung all up my arm trying to get over one particularly untended stile, however once over it we are in a field that seems to have had some kind of failed mustard crop that is roughly equally grass and little pale yellow flowers, with a healthy smattering of chamomile and speedwell along the edges. We miss the next junction as well, do a bit of judicious trespassing and find the path again, via a wheat field edged with wild Lupins which have gone to seed. Daisy puts up a pheasant, much to her delight. As we approach the castle, sun gilds a corn field below the Sugarloaf. Despite it being only 11:30, we have lunch! Before we came away I was frantically trying to finish some work, and swearing at the bank for their useless internet service, and was somewhat distracted, so I left behind half the ingredients that I had carefully purchased for my share of the cooking. So A & I went into Abergavenny for shopping. It isn’t a particularly interesting town, but it has a deli, a good second-hand bookshop (very high quality stock, but a bit overpriced) and a priory church and tithe barn, at which (the church) a wedding is going on – all the men are wearing plain black kilts, with silver daggers instead of those giant safety pins. When we get back everyone but S (who is cooking) has collapsed into bed. We follow suit for a short while and then we reconvene in the eggshell blue living room, J embroidering like a 19th century lady, T reading his kindle, J and A reading newspapers, S reading her book, and there we sit until Daisy demands another walk. Sitting in the kitchen over supper, I glance up, and there are a dozen or more bats flitting about the turret. Sunday morning and four of us (and Daisy) set off for another local walk, much briefer as we have guests for lunch. We head in the opposite direction and take a loop round the back of the local pub through a few fields of horses and sheep, much to Daisy’s disgust, as she has to be back on the lead. She isn’t a bit interested in chasing the wildlife, but after yesterday’s pheasant best to be safe. We are heading confidently for a stile, when we find that the woodland beyond is so completely impenetrable that there is no point even trying to climb it. Fortunately the house nearby has a drive that takes us to the lane, and as it is undoubtedly their wood that has been so neglected, we feel no hesitation at all in once more trespassing. We climb steeply up hill, take a sharp right and find ourselves back in yesterday’s Lupin and wheat field. We arrive back in good time to make preparations for lunch and then sit down to wait, and wait and … Our guests are nearly an hour late. Fortunately all the food is cold, and the sun is out, so sitting in the courtyard waiting for them is no hardship. With the addition of our guests we have reconvened the group that met at the Old Place of Monreith seven years ago (aside from the child who wasn’t even a glint in anyone’s eye at that point). We drink and nibble and then eat, and then take our guests on a tour of the establishment. They are suitably impressed. We set out deckchairs and sit in the sun admiring the view while the child and the dog race about getting properly acquainted. Cake is eaten and regretted. A strange car appears, and S goes off to deal with them, which is just as well as she is a lot more polite than I would have been. They claim they ‘saw’ that there was a castle and thought they’d like a look round. They have come up a difficult to find, unmarked drive, through a closed gate and past a private sign; to a castle that is not visible from the road. So we can’t look round then? They go reluctantly, stopping to gawp on their way. We are furious. I long for a shot gun. I am very proprietorial about ‘our’ castle. Daisy barks thoughtfully as they disappear, having not stirred from her patch of sun the entire time they were there. We agree that none of us would have the gall to drive up to private premises and demand to be shown round. Our friends head home as it clouds up and we all collapse onto sofas with our books until it is time to set out for a meal (that we don’t really want anymore!) at The Bell in Skenfrith, about 30 minutes away. It is raining a bit, but we take a walk round the castle beforehand, and go and speak politely about the weather to the River Monnow. The Bell does lots of local and organic, and ought to have been good, but like many well thought of eateries, the starters are good and the mains aren’t. I come off least well with a very bland pea panna cotta, not one of the constituent parts tastes of anything much; and Jn’s Brill is lukewarm. I wouldn’t have chosen this dish, but it was the only vegetarian option. The boys both go for a starter as main and do considerably better than the rest of us. I could have done this too, I suppose, but there are only 2 veggie starters, and I don’t much like beetroot. The heritage tomato starter is excellent however, the bread rolls straight from the oven are not bad and S’s Rock Bass is apparently good. With aperitifs and one bottle of wine, it comes in at nearly £30 a head for two courses, which I don’t think is justified. The consultation with the river seems to have done the trick, it has been raining heavily while we were eating, but stops before we leave. On the drive back a furry something disappearing into a hedge is claimed variously as a stoat or weasel, personally I think it was a cat! Monday and despite T’s insistence of an 80% chance of rain it is a beautiful sunny, chilly morning. But we are slow to get going or make a decision as to where to go. Eventually we agree on White Castle and a circular walk utilising part of Offa’s Dyke and the Three Castles walk. The weather is perfect, bright, blowy and brisk. 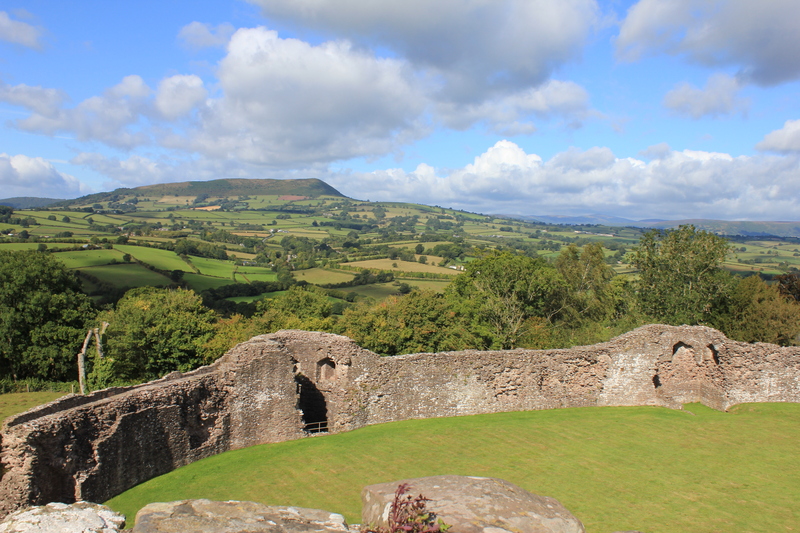 The castle (which A & I visited when on holiday with friends at Longtown about fifteen years ago) is just as good as I remember – enough standing to be able to get to the top of one of the towers, plenty of steps to go up and down, and sufficiently ruined to give a magnificent echo. Views all round spectacular. 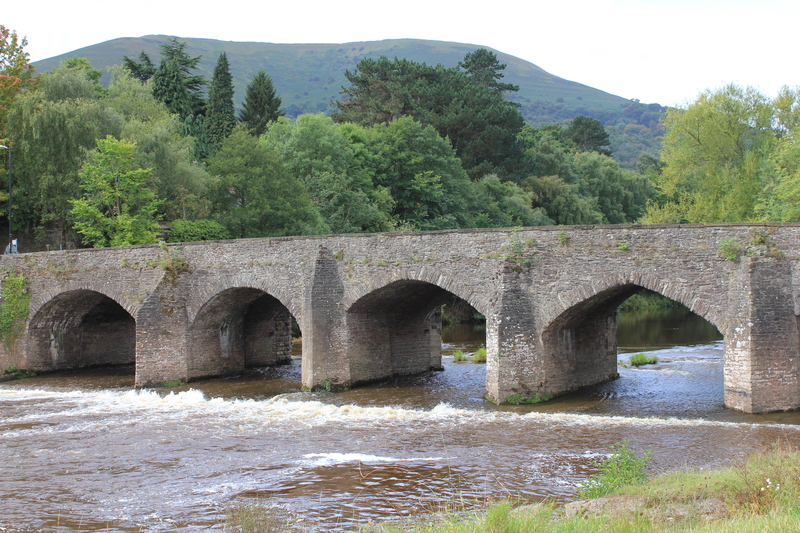 The walk also has just the right amount of views, hills, rivers and bridges; and the rain, which we can see settling in on Crug Hywel, doesn’t reach us until we are back at the car. We drive back to our genteel pink castle and eat leftover curry for lunch and then distribute ourselves around the living room in varying states of sleepiness, until it’s time for Daisy’s afternoon walk. A, Jn and I take her through the wooded pit (a small quarry once?) beside the drive, and out onto the hill for yet more views and once more the rain holds off until we arrive back. I settle down with a book from the shelf, The Bank Manager and the Holy Grail, by Byron Rogers, a very entertaining and sometimes moving collection of essays about Welsh characters and eccentrics. T & Jm provide an excellent dinner. No one stays up long. Tuesday and the weather is undeniably Welsh. It’s blowing a gale and raining, although the forecast is that it will clear by noon. 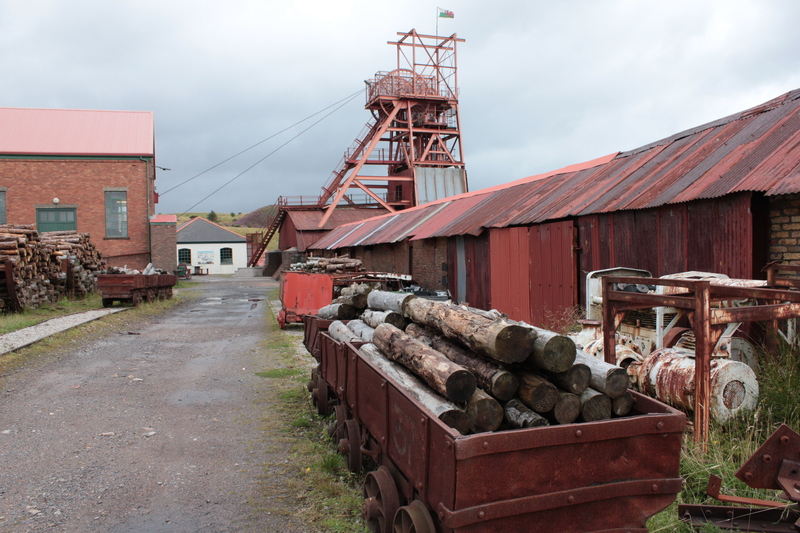 We decide this is the day for the Big Pit at Blaenavon, but all set off separately as the site is large and we don’t know that we all want to do the same things at the same time. Impressively everything on the site apart from parking is free. 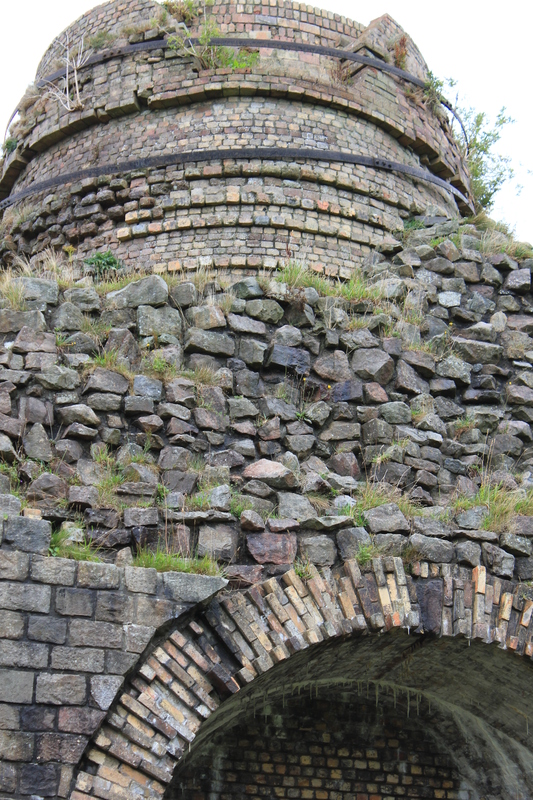 A & I start with the ironworks, which have been there a Very Long Time (1790ish). They are exquisite in the way that only industrial architecture can be – towering brick chimneys, perfectly balanced arches, furnaces like miniature ziggurats, and within reason you can wander wherever you want, peer into anything you want, touch anything you want – including in the range of workers cottages. In the damp aftermath of rain it is very atmospheric indeed. Jn & S have opted to go to Abergavenny market and nearly run us over as they drive past as we are crossing back to the car park. We coincide again at the Big Pit entrance, and then don’t see them again. We don’t spot Jm & T at all. After carefully inspecting the video and notices about the underground tour we decide it isn’t for us, 50 minutes crowded together in confined spaces – not my sort of fun. However we take a look at the exhibitions and wander around the winding gear house and various workshops. The pithead baths are spectacular, and the exhibitions well done. We trundle into town for something to eat, as the miner’s canteen doesn’t have anything on offer that appeals to me, though A would have been very happy with the cawl. Beans on toast and tea later, we head back to Clytha. We have the canal almost to ourselves and it is, despite the roar of the h.o.t.v. road, remarkably peaceful. There is a sheer drop to one side, masked by copious tree growth that doesn’t look all that stable – you wouldn’t want to lean your full weight on any of those trees. The incline on the other side of the canal is equally steep, and once again the trees are hanging on for dear life. Three bridges along, we climb up and onto the track of the disused railway which is probably the one that originates at the Big Pit of yesterday’s visit. This gently drifts back down to where we originally started climbing. Five and a half miles, which felt like only three. Thursday, and we wake to drizzle, which dampens our spirits a bit, but we set off for Tintern Abbey by the route the sat nav insists on despite the fact we want to go via Monmouth and the river route. It is actually very pretty, just not what we intended. It has more or less stopped raining by the time we get there, but despite this it is still grey and overcast, which actually suits the abbey well. It being many years since A & I were there we are happy to look it over again. Jn & S were there a lot more recently but manage to enjoy it again and take great amusement from suggesting the monastic lifestyle to T, who is never far from a smart phone and a bag of chocolate biscuits. We drive back the way we meant to go, but it isn’t as dramatic as we remember – the trees along the road have grown considerably and the view of the river is only glimpsed occasionally. Back at our castle I go back to bed, having been awake since five and up from not long after, and then mid-afternoon, Jn A and I take Daisy for a walk round the Clytha estate. By now the sun is out and the light that intense gold of the end of summer, and it is hot. Daisy finds a way into the river again, points out the stiles we have missed, and has a thoroughly good time until we are on the home run, where we hit two tall stiles in succession with no alternative route for dogs, or at any rate adult Labradors. We manage to woman handle her over the first, but the second is set into an uphill slope and we cannot manage to lift her high enough. She is patient but won’t help, and there is nothing to be done, but phone T and get him to come and rescue his dog. Daisy rides home in the car and we finish our walk, which takes only another 15 minutes. T has promised us a supernova with dinner, but it clouds back up, and there are no stars to be seen, exploding or otherwise. Most of my free waking hours since finishing the opera (apart from work, singing, partying, holidays…) have been spent fighting with the software to get the book to look beautiful. Anyone planning to do a photobook on Blurb be warned you need a lot of free RAM. It does very strange things, like randomly copying chunks of text and shoving them in somewhere else each time you try to format something. To be fair they do warn about pasting large amounts of text, but it kept crashing, and even when I put it on my new laptop, with nothing else loaded apart from the virus guard, and it didn’t save except when you shut it, so if it crashed you lost the lot- so I got in the habit of saving at the end of each page and after every loading of a photo. Its taken three times as long as it should have… But it is finally done, and I’ve ordered a proof copy. waiting eagerly! You chart the gradual emergence of the opera in such a lively and insightful way – it’s a kind of scraggy, no- hoper kitten that turns into a fat cat with presence. It’s a real window into how nourishing participation in the arts can be. Lovely reminder of the intensity of that time in the summer. Great text and pictures, apart from me on page 10 looking like an elephant about to charge !! I sat up late last night chortling away and am now regretting it as eyes on stalks. Thank you Cherry. A terrific job. Sunday: It’s interesting, having looked at Tony’s photos I’m more aware of how our ‘acting’ looks from the outside: who is doing a really good job, who relies on eye rolling and mugging, who doesn’t seem to be acting at all. Adapt our output regulators accordingly. How long do you think Olga mourns Lensky? Was he a good poet? Why does Tatyana write that stupid letter? Anyway, rehearsing is a bit like living inside a soap opera on a loop. Before we get started A and I go out front for some air and a bit of sun, along with several other members of the chorus, some of whom skip off down the high street in our costumes. I can’t help wondering what the burghers of Blackheath make of it; we should take fliers! We meet Rose who is having one of those phone conversations where you give directions by waving your arms about. It turns out the harpist, who wasn’t there at all yesterday, is late and a bit lost. Rose asks us to keep an eye out for her, and rushes off to some other crisis. How do you tell whether a car has a harpist in it? 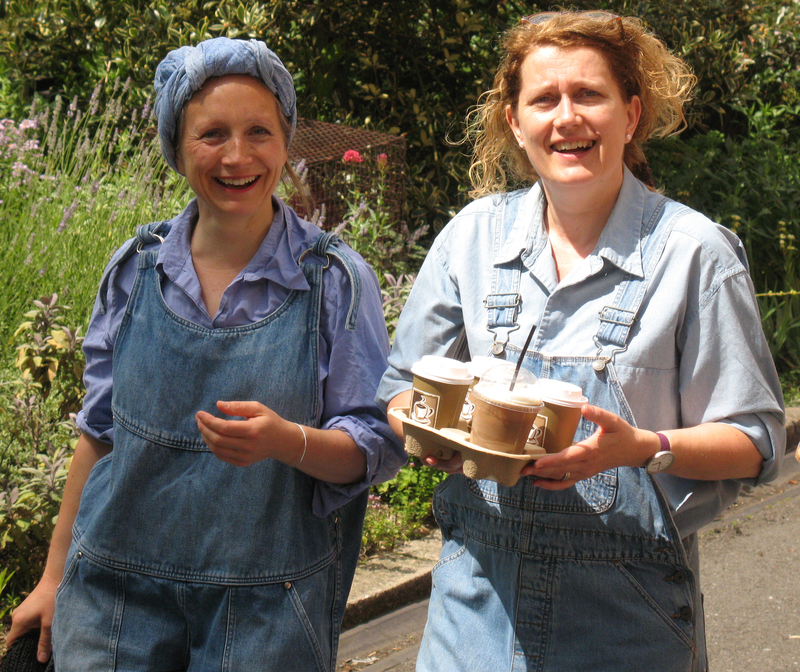 We decide it would need to be a big car, and smile hopefully at a lot of strangers, before Rose reappears and lets us off to get our notes from Harry and Duncan. 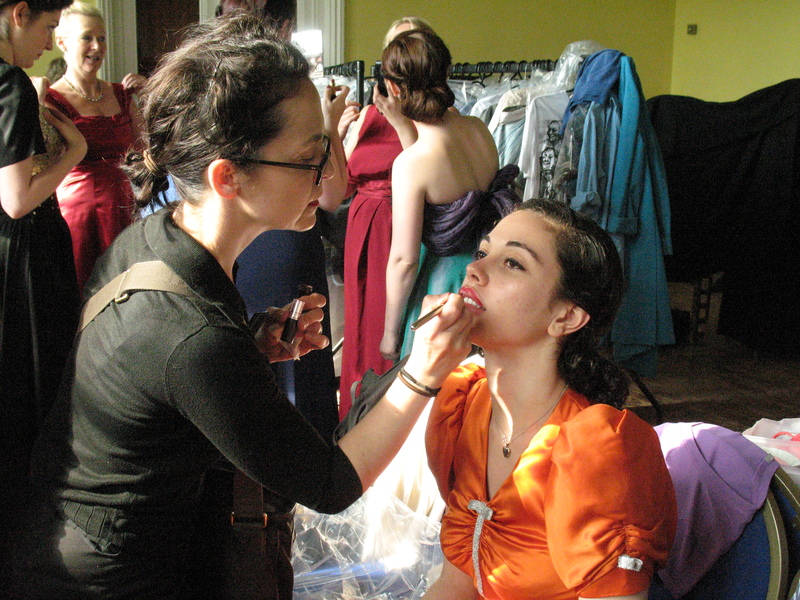 Nicky has arrived to help with hair and makeup and does a fantastic job, aided by one of the ushers, who is a dab hand with a comb and kirby grip. Act I goes very well, although clearly eleven is the maximum cobs David can shuck! 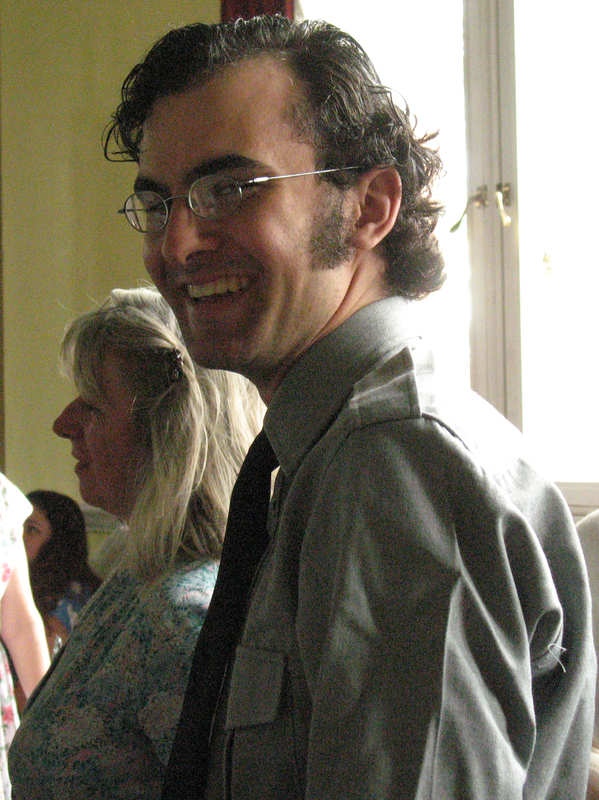 Jonathon has tamed his locks, with help from Simon Dyer, Nicky and our Brycreem, and it rather suits him slicked down with curls at the back of his neck; unfortunately this means he is late for his cue as postman, and isn’t given his bag which is rather crucial to the action. 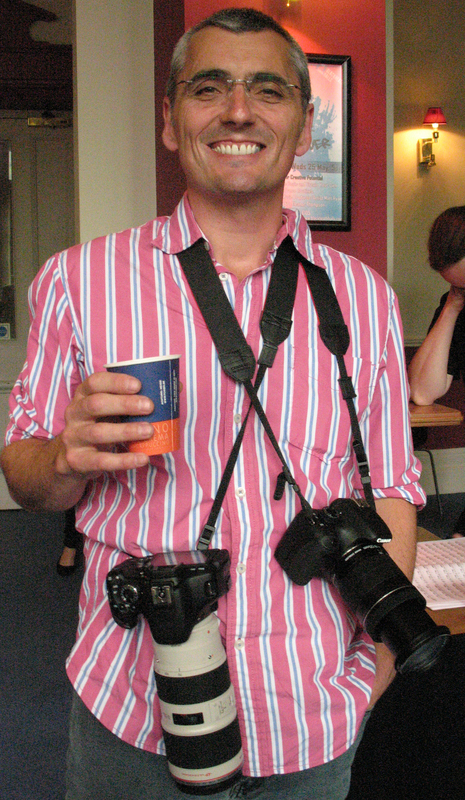 Interval: Cup of tea with Tony and he is very excited because having seen the opera through once yesterday, he is getting into the best place for some really great shots this time. 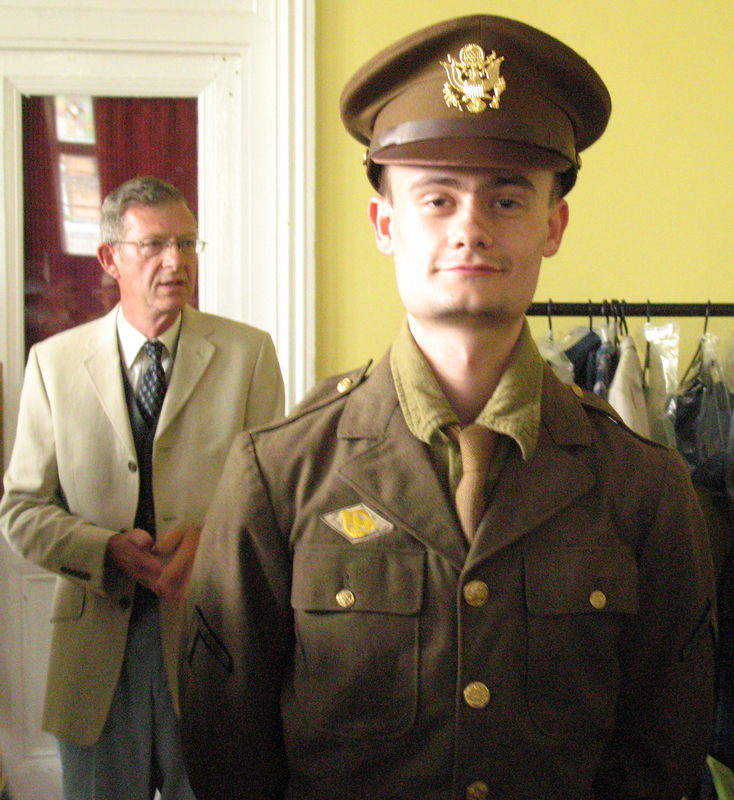 Photos will be available for viewing on his web site soon, and will be available on DVD there are fliers in the dressing room. Peter, from the orchestra, gives me a cheque for 5 copies of the book, that means we are up to 19 paid for-orders. Bring your chequebooks with you folks, it’s all to support next year’s opera and (I hope) a great souvenir. I want to get up to 50 orders, as although you will, of course, be able to purchase individually from the printers website, that will cost you more, and get the Halls less. Act II: there are problems with the musical chairs again; the right number of chairs are put out, but the game takes too long, partly this is because there seem to be an awful lot of children on the floor by our table so we are slower putting out the chairs as we are in danger of clonking someone on the head, but the main problem is that people have been told which round to go out in, so they rush round to chairs on the other side of the row because they are still ‘in’, and it slows it all down. They should just be told that if they are competing with Onegin or Olga (or the crucial child) for a chair to give it up to them. Duncan takes us through Act III about four times at the piano,and as a result we get pretty much all of it right on stage, It is certainly more forceful. 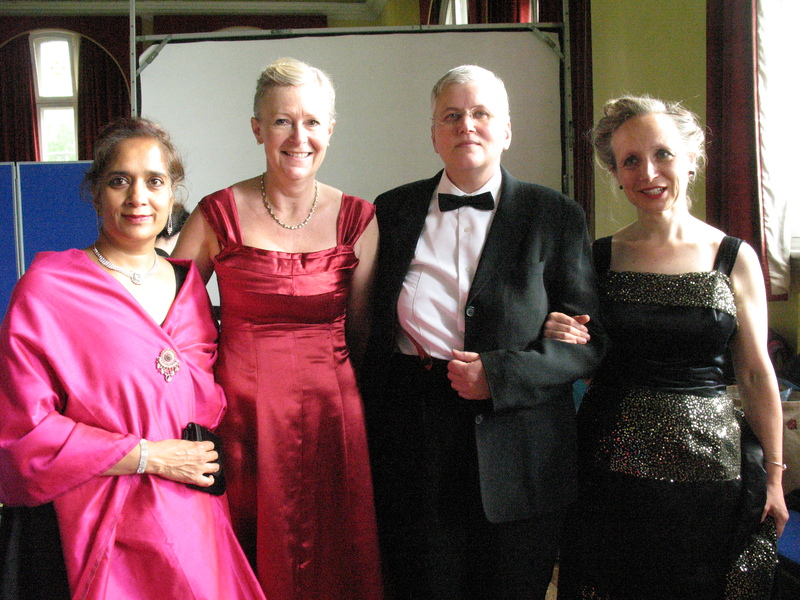 Bryony and co are still trying out different gowns on some members of the chorus, and Mona is a vision in turquoise today. Sarah has an astonishing black and gold number with a train, that made me almost wish I’d gone for a dress after all, though it wouldn’t have the same effect with me wearing it ! The dancers have sprouted little white rose buds on the neckline on their bodices. If I could have one thing different, it would be to have a monitor in the remaining un-monitored corner- it would be in my line of vision most of the time. Act III is a particular problem because my peripheral vision isn’t great, and I have to screw my head right round to see a monitor and loosely appear to be looking at Onegin,as I just can’t see Nick through the wall of basses standing between us. We practice our curtain calls, and then we have to do the musical chairs a few more times, but something always goes awry. Eventually Harry decides the best thing is to drop the first round, so now we have to remember to bring only six chairs from our table. I think we’re ready. First night, here we come! I’ve been decorating the living room, and the piano was really getting in my way – too heavy to move! Solved that, (thanks Muireann) with a bit of lateral thinking and a long pole. So my imaginary blog reader is now asking themselves: Why is she on about pianos? Can she even play the piano? Naah… I can pick out a tune with one hand, I can make up and instantly forget a random cluster of pleasant-sounding chords and seemingly connected notes. I sometimes think I don’t really have a right to own a piano, given how little I make of it. However it got me thinking about my relationship to the beast in the parlour. 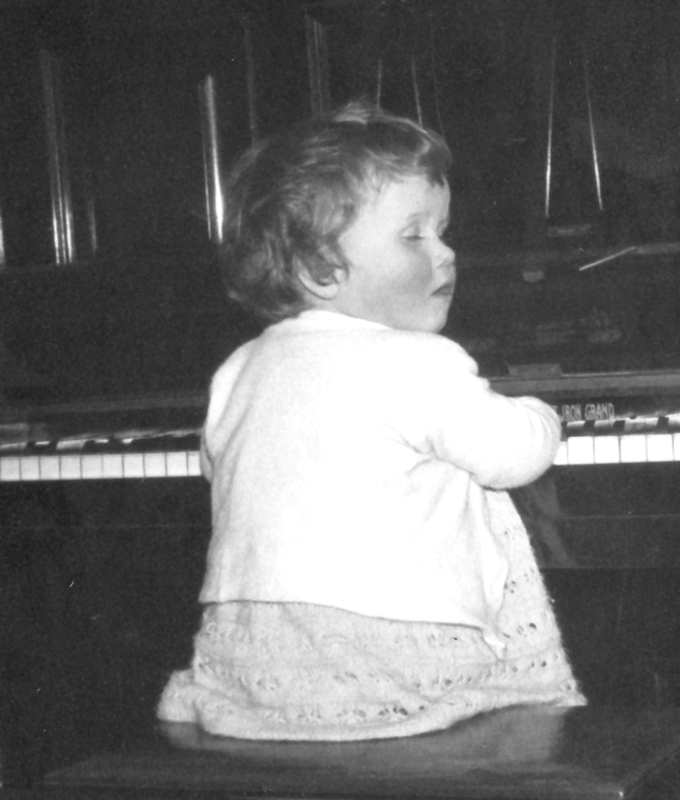 The first piano I had anything to do with was my Gran’s. It was a black, highly polished upright, very respectable with thickly coated keys that slipped under my fingers very satisfyingly, and I remember it having a nice rounded deep mellow tone. it was a place for silver framed photographs and glass paperweights, and in my extreme youth, for posting shiny new Christmas pennies between the keys. As we each got old enough to show sufficient interest my Gran started teaching us to play. As she lived several miles away this was too sporadic to have much impact, but I remember announcing my intention to learn properly when I was about seven. In this I was heavily influenced by my then school teacher the lovely Miss Woodward (who played clarinet) and some jealousy of my old sister who at the time was current recipient of Gran’s efforts to inculcate some music in us. I remember my Mum asking me very earnestly whether I really meant it, and me being rather cavalier in saying yes, having not the slightest idea what I was signing up for. I think we were on a train at the time, on our way to our annual holiday at a once imposing Victorian seaside resort that was rather down at heel by then, but that’s a whole different story. I’m not sure about the exact circumstances but it’s my story, so if I’ve elaborated or rolled incidents together that’s my prerogative. As I remember it, this holiday was the first week of the school summer break and therefore coincided with my birthday, and when we got back Mum announced that a lady round the corner would be giving me lessons once a week in future. This lady (was she called Mrs Gardiner?- it’ll do) had two very impressive grand pianos side by side and nose to tail in her living room. Her house was an exact replica of ours, but seemed bigger, I can’t imagine we could have got two grand pianos into our house. I don’t remember how much this cost but it was measured in Guineas I think seven for ten weeks. There wasn’t really any such thing as a Guinea any more, but it was a delicate way of asking for more than a pound. So once a week I went for a lesson, before school, and a couple of times a week I went to practice when Mrs Gardiner had no other pupils. Not long after this, another neighbour, Mrs Hall of whom I was very fond, offered the use of her piano for practice, so instead of Mrs Gardiner, I went to Mrs Hall most evenings for an hour at her small upright in her very dark back living room. And then mum bought me a piano. I think Mrs Gardiner sourced it, as it came from a house in her road, where the incumbent had died. It cost five pounds, and probably cost more than that to get it shifted down the steep garden steps and up the road to us. Mrs Gardiner began giving lessons at my school and I got to hear how much more talented her other pupils were compared to me, and because (I think!) 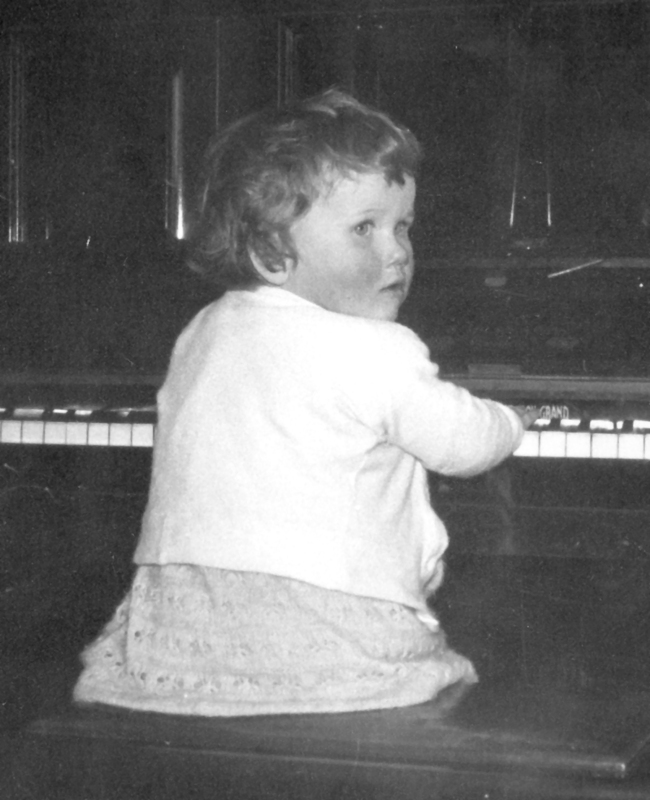 I now could have free lessons at school, I was also put in for piano exams at the conservatoire in Blackheath. I passed, but I didn’t enjoy the experience – I don’t think I was very well prepared, either in my ability, or my understanding of what was expected. I remember Mrs Gardiner commenting that she’d had feedback about her pupils all being rather tentative in their touch. I think she was terribly hurt by this and we all thrashed the piano conscientiously for a bit then went back to our lady-like habits. I can’t remember when I stopped having lessons, or when I stopped playing, but I know I got very self-conscious about playing Emmeline. I know there was one occasion when I went to practice before breakfast and just sat there, looking at her, thinking it was too early and someone would hear me. Mum sold Emmeline to be turned into a drinks cabinet… She says it wasn’t quite as bad as that, but I remember it distinctly, and still regret it. My next piano was rescued from an empty flat when I worked in housing. I was still uncomfortable about people listening to me play, so I wouldn’t put it against a party-wall, and consequently it ended up living in the hall. This was an almost dead piano. The piano tuner said the frame was cracked and euthanasia would be kinder. I resisted – there was nothing more soothing after a tough day at work than to crash about on a piano that gave as good as it got. So there it stayed in the hall, until the house had to be underpinned, (no connection!) and it was ridiculous to store it, so I gave it away. I missed it as soon as it had gone, but it was many years until I got the latest. Neighbours were moving and the children had outgrown wanting to play. I went round and looked a bit doubtfully at this enormous rather unattractive player-piano. Mindful of the old wreck I’d rescued before, I got in touch with the piano tuner, who referred me to a player piano specialist. The specialist looked it over said it was rather a good piano but that the player function was adrift, and I rashly decided to give it house room, rather against A’s wishes. “Will you play it?” she asked suspiciously. “It will play itself,” I replied, having not asked enough questions. Men came to move the monster 2 doors up to its new home … well they tried … player-pianos weigh about twice what a normal one does. two hours of cursing sweating and effort from the men and mild hysteria from me, and the monster was squatting in my dining room, a little too close to the door, but notionally where I’d asked for it to be. The men went mopping brows and still cursing. And there it still sits: I only want it moved a couple of feet but it is completely impossible without specialist equipment. Occasionally I worry that it will actually cause the need for more underpinning. Then I discovered that this type of player piano (an Angelus) was discontinued in the late 1920’s and you can hardly get rolls for it, almost any other make would be no problem. The specialist said there was no point fixing the mechanism unless I had something to play on it. Sometimes I think about taking out the pipes and bellows to relieve the weight. The neighbours sometimes comment when they hear me playing, but I don’t mind so much these days. It does have a nice tone though. So what if the E sticks in wet weather? And so what if I really wanted was a clavichord? Off to play it while there’s no one in! 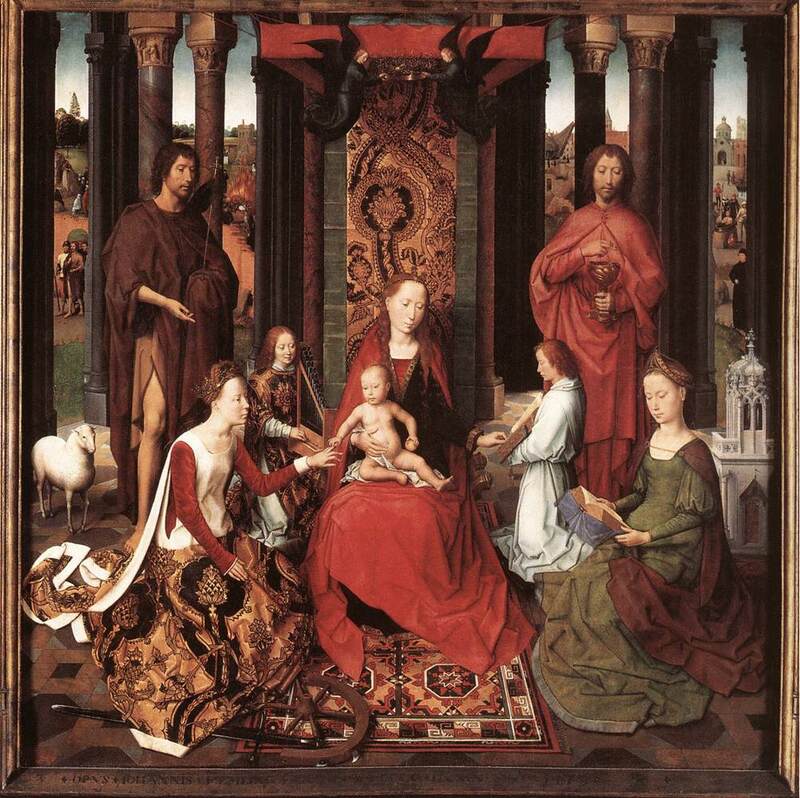 The Memling Triptych, Sint Jans Hospitaal, Brugge. I wrote this in 2007 as part of an essay on silence for my coaching course. I am now completely hooked on Memling and have written a story based on his pictures; Portrait of The Artist’s Model as a Young Woman. We’ve been walking around the museum for over 2 hours and now, this is the masterpiece: this is IT. The virgin sits with the child on her knee, and St. Catherine, with her sword and wheel tucked part beneath her skirt, kneels beside her. The child places a ring on Catherine’s finger, not yet past the second knuckle, and there is a look passing between them. The child, serious, loving, concerned, thoughtful; Catherine, wondering what does this mean? And holding her breath with foreknowledge that it is not going to end well. 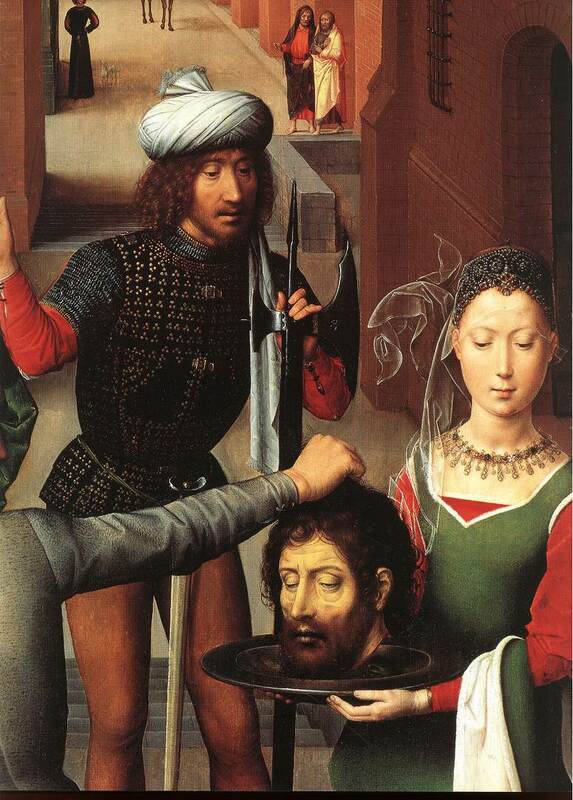 The same woman has been the model for virgin and Catherine, and St Barbara (who has her head resolutely in her book, like me waiting for a plane- if I do not think about this, it will not happen) and Salome, flinching away from the gift of the Baptist’s head. But it is the look on Catherine’s face that keeps me gazing, walking backwards to the clear plastic chair because I can’t stand longer, and gaze some more. on one side the four horseman of the apocalypse prancing about in a puddly landscape of drying sea that reflects the rainbow of heaven; on the other, the sassy bum of the executioner, who fancies his chances with Salome, who has shown herself to be less than chaste with that dance. In the centre Catherine, her heart in disarray, one cuff down and one up, wilting slightly at the enormity of it all, the pulse in her throat almost visible. Next day we come back as soon as the museum opens, and sit and gaze some more. The museum guard keeps a watchful eye on us, wondering if we are planning a heist. We sit for two hours almost speechless, pointing out details to each other with upraised hand and incoherent sub-vocal murmur, feeling as the medieval viewer of this picture must have felt, awed and silenced. This is the silence of wonder, mine at Memling’s art, his at his creator, Catherine’s at fate.